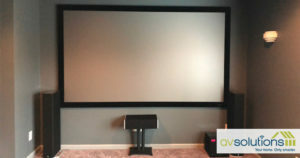 We’ve loved completing various home theater and media room installations throughout the metro Atlanta area! 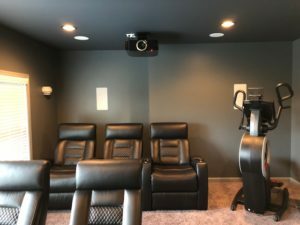 The home theater featured below is one of our most recent projects and showcases the project as a whole, from the projector and audio equipment to the lighting and seating. This particular client opted for multiple floor-standing speakers and various nearly invisible surround sound speakers throughout the room. 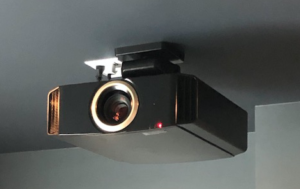 The high-quality projector and audio equipment chosen allows the client to experience crystal clear images and concert-quality sound. 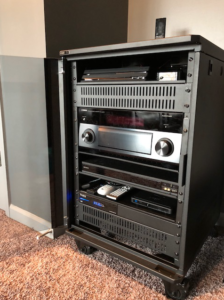 And the home theater seating was the perfect complement to the look and feel of the room, providing plenty of space and comfort for any user. We were even able to lay out the room to include an elliptical! View the project photos below or on our Houzz page. Interested in viewing more of our recent projects? Follow and browse our Houzz page and add any photos you like into your ideabooks. Then, schedule an appointment with our team to discuss your next project in the metro Atlanta area!